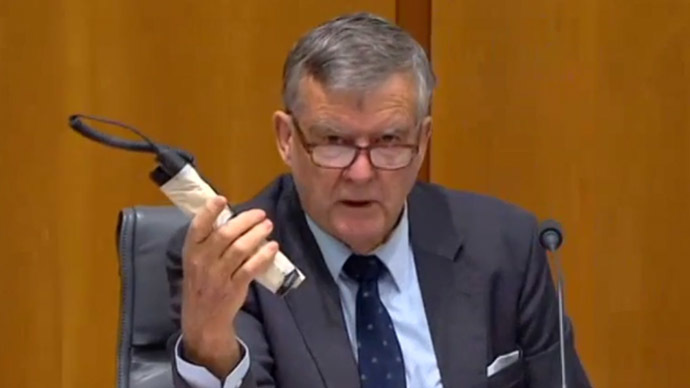 An Australian senator stunned fellow politicians after bringing explosives into a session, saying he had “brought this through security: a pipe bomb,” which brought gasps from stunned onlookers. The measure is designed to save the department money, speed up entry and allow internal security staff to be deployed away from entrances to other areas of the building. Heffernan is a member of the Finance and Public Administration Legislation Committee, which at the time was questioning Australian Federal Police Commissioner Tony Negus about routine police and security issues. Negus had been told in advance about Heffernan’s intention to take a fake bomb into the building, but other senators had been left in the dark. "Up until this point, most people working in this building know that it is safe, but I don't think it any longer and to demonstrate that this morning what could be... I brought this through security, a pipe bomb," Heffernan said. He later went on to recall, "When I was a kid we used to blow stumps out on the farm, 50 years ago. We'd get some nitropril, a quart of distillate, a plug of jelly [gelignite] and a detonator, light the bloody thing and [it would] go to buggery. It could blow a tree the size of this building out of the ground." Before the trial started last week, virtually everyone who worked in Parliament House had to go through an airport-style metal detector and have their bags x-rayed. "At the present time there is nothing to stop anyone from bringing those ingredients in here over a period of time through security, would you agree?" Senator Heffernan asked. Negus responded, "Senator, under the current arrangements, that is a risk, yes." The Australian Federal Police Commissioner went on to say that the federal police, who provide security for the perimeter of Parliament House, had raised security concerns with the department of parliamentary services. "We have been in regular consultation with them through the Attorney-General's department, we have briefed the presiding officers of the Parliament on our concerns and what we would put forward as an appropriate level of security," Negus said. Heffernan is no stranger to controversy. In March 2009, he had an 18cm pocket knife confiscated while going through security at the New South Wales state Parliament House. On that occasion, he was not trying to make a point concerning relaxed security; rather it was his right as he was a farmer. In 2012, Heffernan allegedly hit senior Liberal staffer Ray Carter and abused him for being homosexual. It is alleged that during a meeting between the two, the liberal senator struck Carter so hard he was knocked off balance. Later, when Carter was alone, Heffernan is alleged to have said to him, "I didn't know you were a poofter [offensive slang for ‘gay’]."